A 13-member team consisting of the crème de le crème of Guyana’s powerlifters winged out yesterday for Orlando, Florida USA to do battle in the six-day NAPF North American/FE.SO.PO Pan American/ Caribbean Islands Power lifting Championships. 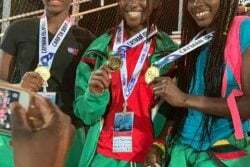 According to a press release from the Guyana Amateur Powerlifting Federation (GAPF), the team comprising 12 males and Kimberley Mars-Loncke (2012 Caribbean silver medalist) will begin their quest for individual as well as team honors tomorrow with Mars-Loncke seeking to go one step further than Dawn Barker in becoming Guyana’s second female Caribbean and first ever female Pan American Champion. The men’s team will be spearheaded by World Masters Two 74kgs champion Winston Stoby and will include the likes of Randolph Morgan (2012 World dead lift champion) John ‘Big John’ Edwards (2011 World Masters bronze medalist), Vijai Rahim (2012 Caribbean double gold and South American silver medalist), Anis Thomas (2012 Caribbean gold medalist and Junior best lifter overall), Paul Adams and Karel Mars (2012 Caribbean silver medalists) along with promising lifters Gumendra and Suraj Shewdas, Fabian Ketwaroo and Colin ‘Mr. Clean’ Chesney who will be seeking to break his international jinx. 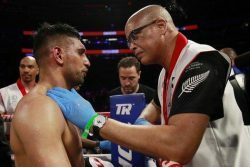 The release added that despite a timely and welcome infusion of funds from the Office of the President through President Donald Ramotar. 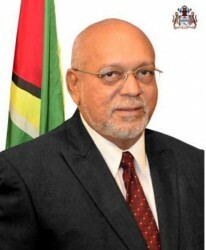 The team, the release stated, departed with a shortfall of some USD 3000 and the lifters will hope to bridge this shortfall based largely on the support of the Guyanese community based in Orlando in order to accomplish their mission, the release added. 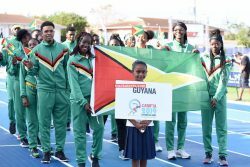 While in Orlando at Congress, GAPF President Green said he will be hoping to convince the South American and North American blocs to grant Guyana the hosting rights to the 2015 Pan American and South American as well as the Caribbean Championships. Going For Gold! Guyana’s contingent of powerlifters strike a pose at the Piarco International Airport ahead of their international duty in Orlando, Florida.